Innovative, synthetic stock with design features that enhance accuracy and usability. Full length, aluminum insert, molded into the forearm, improves strength without excess weight. Serrated bottom keeps rifle steady when shooting off bags. Accessory rail includes a quick detach bipod adapter. Aluminum blocks give a rock solid, stock-to-action fit; barrel channel is free floating. Buttpad is adjustable for length of pull; cheekpiece adjusts for height, fore and aft position. 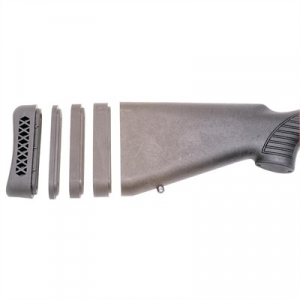 Mfg: Choate SPECS: Buttstock Spacer Pak - 1/4", 1/2", and 3/4" buttstock spacers.